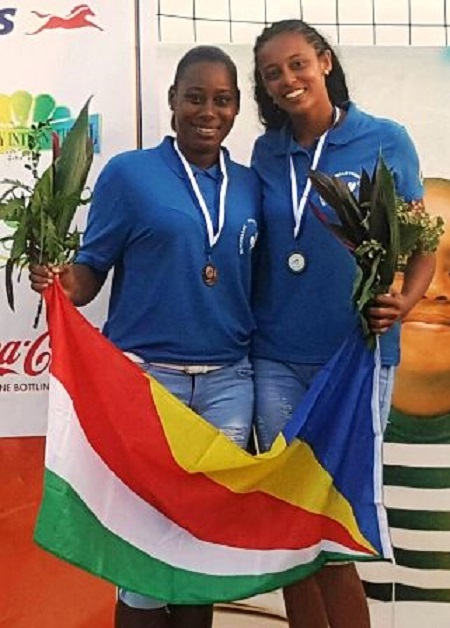 (Seychelles News Agency) - Volleyballer Angelique Adeline, of the Praslin Girls team, won the Most Valuable Player (MVP) award and also the Best Attacker award in the African Zone 7 competition held in Seychelles earlier this year. Adeline, 24, comes from Anse Kerlan on Praslin, the second-most populated island, but is working on the main island of Mahe. SNA caught up with the local volleyball player to learn more about how she manages to work on Mahe and train on Praslin. SNA: Tell us a little about yourself. AA: I am the only child and I have a son. He is 5 years old. I moved to Mahe when I went to post-secondary school. I did an advanced diploma in business studies and accounting and then to the University of Seychelles. I graduated last year with a bachelor's in business administration with international business. SNA: When did you start playing volleyball? AA: When I was in S2 (Secondary Two), my coach Sonny Athanase asked me if I wouldn’t be interested in playing volleyball, with my height and all, I’ll perform really well. I took his advice and started training but only for the school team where we competed against teams from La Digue and Mahe. I missed the CJSOI (Commission de la Jeunesse et des Sports de l'Océan Indien) games in 2008 because only players registered with a team were able to participate. At the time, I was not registered with any team and played only at the school level. In 2009 I registered with a team from Baie St Anne and got the chance in 2010. We came out second in the competition in Reunion. SNA: When did you join Praslin Girls? AA: In 2009. Back then, the team was called Baie St Anne sisters. We changed our name to Praslin Volleyball Club and then to Praslin Girls. SNA: How does it feel to win the titles Best Attacker and Most Valuable Player in the African zone 7 competition? AA: I am very happy as for a long time now I have been working really hard. Playing volleyball is something that I have come to love over time. I am happy that the effort I made has been recognised. I have participated in the IOCC (Indian Ocean Club Championship) game in 2014 with ARSU. When I started school on Mahe, I played with ARSU. I have achieved something as an individual player. SNA: How do you balance work, motherhood and playing volleyball and travelling between Praslin and Mahe? AA: I give thanks to my mother and father as they have always been here for me, as my son lives with them. I am an only child and they always wanted a little boy and in sense, my son is her long-wanted son. Looking for a babysitter has never been a problem for me when I was heading to play volleyball. Every Tuesdays and Thursdays, I fly to Praslin to train. That is a bit tough because as soon as I finish work, I need to rush to the airport to fly to Praslin. At times I even face problems at the airport. But if you love something, nothing will stop you from practising it, even if it is tough. I have gotten used to this though. At the workplace, we are flexible and they give me full support. 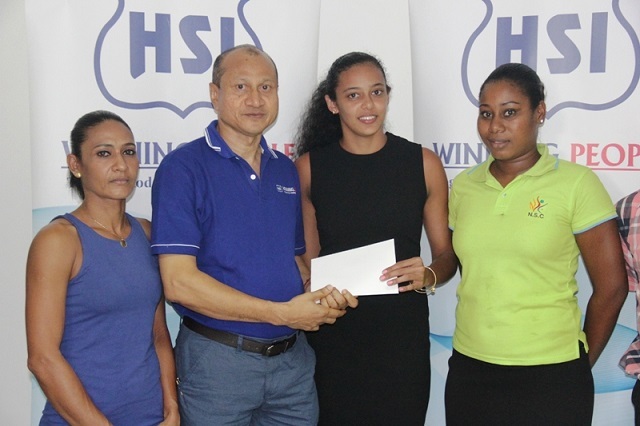 SNA: How do you see the development of women's volleyball on Praslin? AA: When I look at women's volleyball on Praslin, I find that we have a lot of potentials. However, we are not given enough support. We are given the same amount fund that teams on Mahe receive every year, which is SCR 12,000 ($881) per year. We spend SCR 6,000 ($441) for only one match when we come to play on Mahe. We have also been asking for some time now to get an indoor training area on Praslin so that we can train even when it rains. At the moment we train on an outdoor court that is exposed to the elements. I feel that if this is done we would improve greatly. We don’t come to Mahe often to use the indoor facilities and when we have to play at the Palais des Sports (an indoor gymnasium) at Roche Caiman, you can see that there is a change in the way we play. At times we cannot participate in knockout tournaments as we don’t have the funds to do so. This is not fair as teams on Mahe only pay bus fares but we have to fly 12 players along with the coach when we have to stay on Mahe and plus the accommodation. SNA: In view of these constraints, have you considered joining a team here in Mahe? AA: There have been times when I thought about it, which would be much easier for me as I wouldn't have to be travelling back and forth between Mahe and Praslin. However, I love my island and looking at the level that we have attained, and to have finished in second place at the IOCC game, I don’t want to leave my team. I have been approached by several teams on Mahe. SNA: Were you expecting Praslin Girls to take second place in the Indian Ocean Championship? AA: Nope, I was not expecting us to come in second but we did come with a determination to win. I am proud of our result even if we came out second. This is the first time that we participate in such a competition. I am so proud of my team. Three years ago we came out fourth in the league. Two years ago we came out third and last year - second. This year we are targeting first place. We want to qualify to go to Madagascar for the next African Zone 7 competition. SNA: Are you in Seychelles’ national team? AA: I have been chosen several times but due to the fact that I was studying I wasn't able to participate in training camps. Now that I have completed my studies, I am in the pre-selection that has been made. I have participated in the beach volleyball and in the CJSOI games. But so far I haven’t had the chance to be in the Indian Ocean Islands Games. I would love to represent Seychelles and will be proud to be chosen in the final 12. SNA: Have you ever thought of playing at the international level? AA: I have been approached before and that was when we went for an African competition in Egypt with ARSU. A coach asked me if I didn't want to play for Egypt but at the time I was still studying and I had to pass over the opportunity. Even now, should I be given such an opportunity, I don't think I will be able to accept as when you go to university you are bonded to work for five years in Seychelles. By the time I'm done with the bond, I will be 30 years old and I don't think that will get such opportunities again. SNA: What would you like to pass on to the youth of today? AA: I would like to encourage more youth to join sports. This will get them away from bad influences. Who knows, maybe they will make a name for themselves and become a local celebrity. They could be making Seychelles proud instead of giving it a bad name.